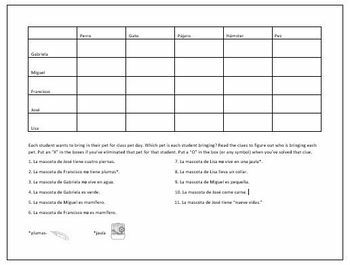 This is a one-page logic puzzle with 11 clues in Spanish in which students will try to figure out which student is bringing which pet to school for Class Pet Day. There are five students and five pets. There are two clues which require interpretive reading skills (using cognate and context awareness/clues) and the rest are written in level one Spanish. There are two new words that will likely be unknown to students and those are defined below with pictures instead of English words. The instructions are written in English (seminars I've attended recommend this for this type of activity) but the sheet is fully editable if you're interested in 100% Spanish. Students love solving logic puzzles and puzzles are good for students' brains. An answer key is provided. Enjoy!